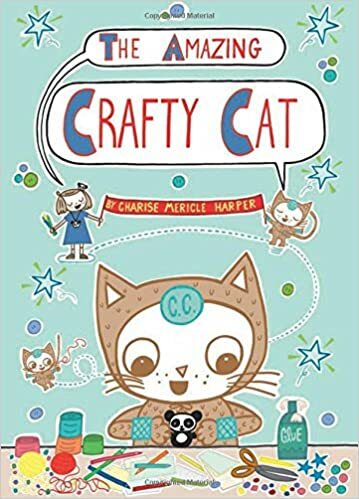 Summary: Birdie is an imaginative girl with the alter ego of Crafty Cat, a confident cat who is an amazing crafter and uses her crafts for good. When Birdie drops her panda cupcakes on the way to school, they are ruined and she has nothing to offer for her classroom birthday celebration. A call home for more treats is unsuccessful, and Birdie must use her own creativity to find a solution. Crafty Cat saves the day, with a Panda Pals craft that the whole class loves. Anya, the mean girl, gets her comeuppance, and Birdie declares it “a great birthday”. A 10-page section at the end includes directions for four panda crafts and panda cupcakes. 128 pages; grades 1-4. Pros: Lots of fun for early graphic novel fans. Birdie is a strong, resourceful, and funny protagonist, and the extensive crafting directions are an added bonus. Cons: The color palette is a little blah.